I really wanted to film this as a video but time has slipped away from me so unfortunately it will just be the written word this month, I hope that's okay for you lovely people! It it September - the month I have been looking foward to most this year.... it's only a matter of days (15 to be precise) until I'm on a plane to Florida - wahhhooooo! 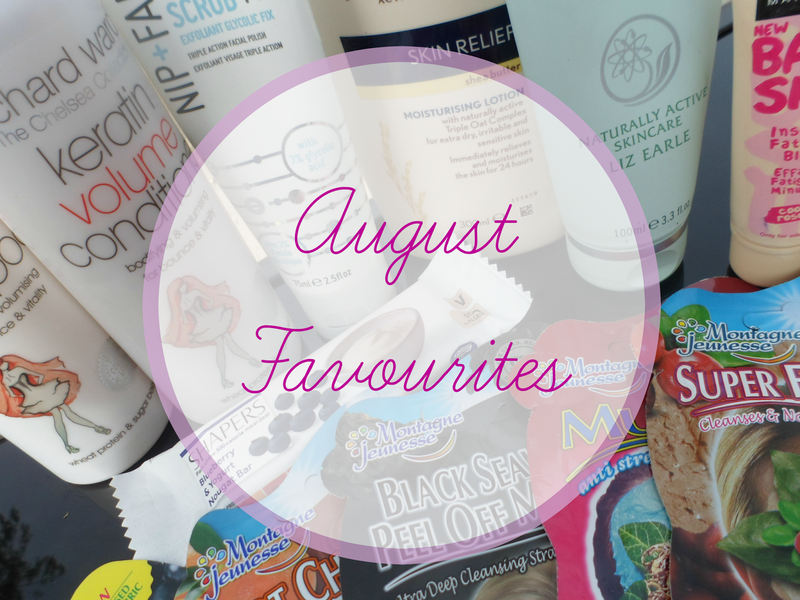 Anyway with a new month beginning it means it's time for me to share with you my monthly favourites for the month of August! Of course it's mostly beauty related... I mean why else are you here reading this?... but in true Kirstie style there's a few random little picks in there too! First up, a BIG love of mine which throughout my whole time doing this blogging lark I've always bigged up to the max. Yes I'm talking about Liz Earle Cleanse & Polish, I'm an Isle Of Wight girl so am of course a big lover of Liz Earle and their products and this has got to be my favourite. For a few months now I have been trying out and using other cleansing products but coming back to this this month has reminded me of how amazing it is and how I should really never stray from it. Next Nip + Fab Glycolic Scrub Fix*, you may remember I did a post on this a little while ago and my love for it hasn't died! I use this one a week, it's a little harsh for anything more, and it leaves my skin feeling so soft and smooth with a gorgeous brightened look, definitely the perfect scrub for me. Skincare find of the month has to Aveeno's Skin Relief lotion. This has rescued my dry and itchy legs and made me feel a whole lot better - this is one that is going to be repurchased alot I feel. Hair favourite this month have to be the Richard Ward The Chelsea Collection Keratin Volume Shampoo & Conditioner*. I've using this these for the last couple of weeks and have found a new fav to rival Lee Stafford! These two leave my hair so light and airy, like doing backwards hairwashing - you know when your hair feels really light and free of product, after every shower I can run my fingers through my hair before I've even gone near it with a comb or a brush. It's so managable and dries super quick aswell. Dry, my hair feels soft and I definitely can see and feel a difference in how quickly it gets greasy too! Make-up now and my favourite product from August is the new Maybelline Baby Skin Instant Fatigue Blur Primer in cool rose. I've used this probably every day since purchasing it at the beginning of August, another great product by Maybelline they've really gone up in my books over the last few months. Montagne Jeunesse face mask sachets have to be in my monthly favourites this month - how they haven't made it into one so far is a mystery to me! These are my faourite little pamper treat and tend to do one a week! These are normally around £1 (and sometimes on offer for even less) total bargains! My favourites have to be the hot spring sauna and the clay fabric mask ... I've got a few newbies here too which I can't wait to try out! A food favourite now! I have a major sweet tooth but I have been trying for the last few months to avoid the chocolate temptation that is constatnly in my mind and stomach! In doing this I have been finding alternatives to tackle the sweet tooth that controls my diet and in so found these Boots Shapers Blueberry & Yogurt Nougat Bars. These are soooo good, a chewy yogurt flavoured bar with yummy blueberrys dropped in - these have become my evening sweet snack (normally when watching the first look episode of Hollyoaks on E4!) they need to start selling them by the box! TV fav's this month have got to be Long Island Medium, Scandal, Hollyoaks & Pretty Little Liars! I'm not sure I can cope with waiting 4 months until I can see more PLL.... that show is so addictive - I need answers! Long Island Medium & Scandal are both new shows to me, I found them on Netflix and was hooked after the first episode of both - love love love. Music wise OF COURSE I'm going to say Ariana Grande & Taylor Swift. Yes my 2 favs have released new music and I am obsessed. Taylor's first single of the new album Shake It Off is amazeballs.... that girl can do no wrong, roll on October when 1989 is out! And the album I have been waiting for all year My Everything from Ariana Grande is everything I hoped it would be - I've had it on repeat since downloading it the second it was available on iTunes and I'm just praying she goes on tour here in the UK! My favourite songs are Break Free, Break Your Heart Right Back, One Last Time.... and of course Bang Bang!! I love the face masks, always a great treat in the week! I haven't been too keen on the baby skin primer though. I find it makes my skin oily! Those sachets look really cool. Great find. POTW #32 : My Favourite Mascara.... Ever.